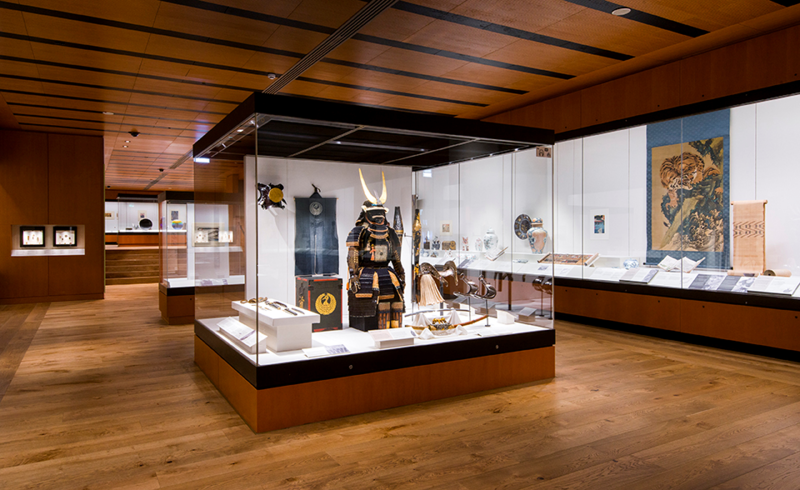 A few months ago, on 27 September 2018, the British Museum’s Mitsubishi Corporation Japanese Galleries reopened to the public after nine months of major refurbishment. The revamp celebrated the renewal of a 10-year partnership between the British Museum and Mitsubishi Corporation. The makeover transformed the once carpeted gallery space with a lighter and gentler feel with new flooring, ceiling and lightings to showcase Japan. The British Museum’s Japanese collection is undoubtedly one of the most comprehensive outside of Japan. The galleries provide a rich visual narrative of the country through the display of over 430 artworks and artefacts from the Museum’s 36,000 Japanese objects. The range of objects is extensive. 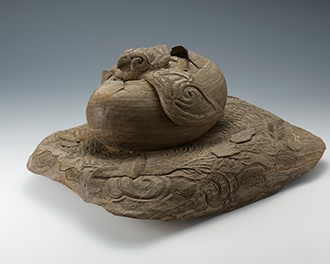 Popular exhibits include the stout dogū figurine from the Jomon period (14,000 – 300 BCE), a mesmerizing porcelain charger (large dish) titled ‘Dawn’ with deep strips of blended glaze work by the late Living National Treasure Tokuda Yasokichi III (1933-2009), and the sublime urushi lacquer container with a shimmering cascade of chrysanthemum petals in gold maki-e by Murose Kazumi (1950-), another artist designated with the ‘Living National Treasure’ title. New acquisitions include both historic and contemporary pieces, including specially commissioned pieces. Two are particularly striking. The first is a set of take-away inspired porcelain sculptures by the ceramic artist Hosomi Hitomi. Best known for her elaborate floral inspired bowls where she meticulously appliqués hundreds and thousands of individually mould-pressed shapes, she shifted her focus away from the world of nature for the British Museum commission to the world of Seven Sisters Road in London. Combining her interest in drawings and everyday life, she created a batch of porcelain made fish and chips covered with hand-drawn illustrations and knobby shapes. The second is a wood carving sculpture by Kaizawa Toru, a living Ainu artist. Ainu people are indigenous people of northern Japan and the Kamchatka region of Russia. Their heritage, including artistic heritage, is unique and distinct. Ainu people have experienced a long history of discrimination and prejudices, especially when Meiji government swept control of the country and introduced social, political and economic reform measures to modernise Japan following Western examples. However, in recent decades, there has been a resurgence of interest on the Ainu people and culture at all levels including academic research. Kaizawa Toru is a practicing artist who lives in the remote village of Nibutani in Hokkdaido. His great-grandfather, Utorentoku Kaizawa was one of the two artists renowned for their skill in the Meiji Era. 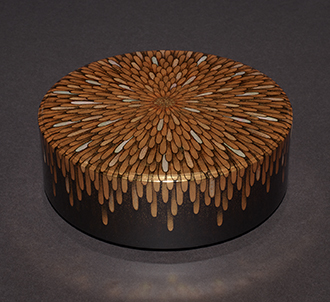 Kaizawa works mainly in wood and creates carved pieces inspired by Ainu tradition and nature. Often using Ainu decorative patterns and elements in his pieces, he fuses the culture’s visual traditions with his own personal style. ‘Spirit Reborn’ (Kewtum kanna-suy)’ made for the British Museum’s Culture Corner is an elaborate example of the bold and involved expressions that typify Ainu art and his fluid rendering of shapes. In a few months’ time, the much talked about Manga exhibition will open at the British Museum. Curated by Professor Nicole Coolidge Rousmaniere, who many will know as our founding and researchh director of the Sainsbury Institute, the exhibition is to a great extent the fruit of her labour of love, enthusiasm and intense dedication to bring the largest body of manga-based work to the UK. Manga, best described as a visual narrative art form, has its roots deeply seated in the visual history of Japan. Linked to medieval illustrated handscrolls, manga has evolved to become one of the most immersive, thematically diverse and playful expressions complete with a world-wide following. ‘Manga’ is billed to be the biggest exhibition on Manga outside of Japan. It will open with an accompanying exhibition catalogue that includes a number of interviews with major manga artists. The exhibition will be held between 23 May and 26 August 2019 and the ambition and scale will no doubt attract a strong interest from not just national, but also global audience. 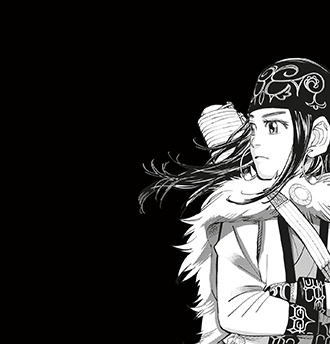 With the British Museum upping the game by hosting and thereby placing manga on the museum’s cultural map will help strengthen the appreciation and research that the genre well deserves.